The Securities and Exchange Commission (“SEC”) has recently reiterated its stance against problematic pretaliation severance agreements that attempt to require outgoing employees to waive their rights to recover a whistleblower bounty or to bring a qui tam action against his or her soon-to-be former employer. Over the past two weeks, the SEC has announced two separate settlements with companies accused of utilizing severance agreements that targeted whistleblowers in violation of whistleblower protection rules. As a result of these settlements, the companies have agreed to pay fines of approximately $265,000 and $340,000, respectively. SEC Announces $265,000 Settlement with BlueLinx Holdings Inc. According to the SEC’s order, from approximately August 2011 until the present, BlueLinx entered into severance agreements with certain employees who were leaving the company. As part of the agreements, BlueLinx “prohibited the employee from sharing with anyone confidential information concerning BlueLinx that the employee had learned while employed by the company, unless compelled to do so by law or legal process.” The severance agreements also “required employees either to provide written notice to the company or to obtain written consent from the company’s legal department prior to providing confidential information pursuant to such legal process.” However, none of the severance agreements “contained an exemption permitting an employee to provide information voluntarily to the Commission or other regulatory or law enforcement agencies,” the SEC said. [The Employee shall not] disclose to any person or entity not expressly authorized by the Company any Confidential Information or Trade Secrets….Anything herein to the contrary notwithstanding, you shall not be restricted from disclosing or using Confidential Information or Trade Secrets that are required to be disclosed by law, court or other legal process; provided, however, that in the event disclosure is required by law, you shall provide the Company’s Legal Department with prompt written notice of such requirement in time to permit the Company to seek an appropriate protective order or other similar protection prior to any such disclosure by you. The SEC says that some 160 BlueLinx employees entered into severance agreements with the company that contained the two provisions set forth above. By including those clauses in its Severance Agreements, BlueLinx raised impediments to participation by its employees in the SEC’s whistleblower program. 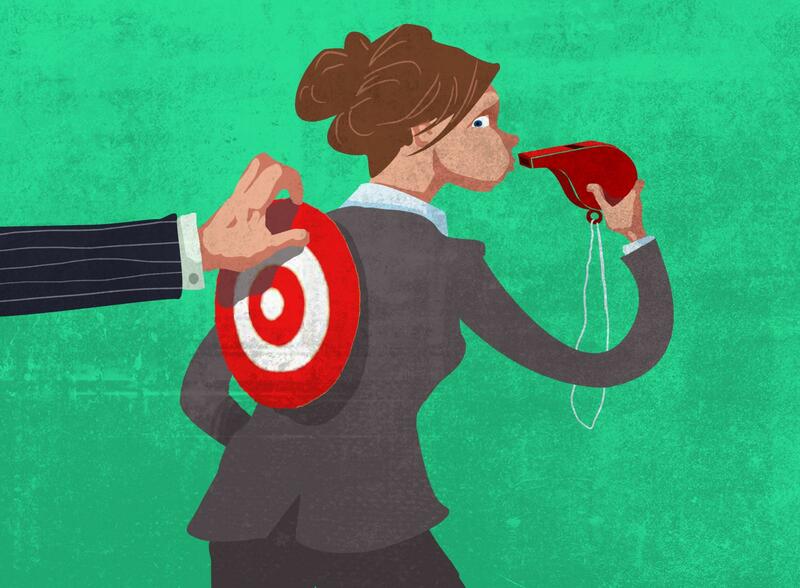 By requiring departing employees to notify the company’s Legal Department prior to disclosing any financial or business information to any third parties without expressly exempting the Commission from the scope of this restriction, BlueLinx forced those employees to choose between identifying themselves to the company as whistleblowers or potentially losing their severance pay and benefits. Further, by requiring its departing employees to forgo any monetary recovery in connection with providing information to the Commission, BlueLinx removed the critically important financial incentives that are intended to encourage persons to communicate directly with the Commission staff about possible securities law violations. Protected Rights. Employee understands that nothing contained in this Agreement limits Employee’s ability to file a charge or complaint with the Equal Employment Opportunity Commission, the National Labor Relations Board, the Occupational Safety and Health Administration, the Securities and Exchange Commission or any other federal, state or local governmental agency or commission (“Government Agencies”). Employee further understands that this Agreement does not limit Employee’s ability to communicate with any Government Agencies or otherwise participate in any investigation or proceeding that may be conducted by any Government Agency, including providing documents or other information, without notice to the Company. This Agreement does not limit Employee’s right to receive an award for information provided to any Government Agencies. SEC Also Announces $340,000 Settlement with Health Net, Inc.
[N]othing in this Release precludes Employee from participating in any investigation or proceeding before any federal or state agency, or governmental body . . . however, while Employee may file a charge and participate in any such proceeding, by signing this Release, Employee waives any right to bring a lawsuit against the Company, and waives any right to any individual monetary recovery in any such proceeding or lawsuit or in any proceeding brought based on any communication by Employee to any federal, state, or local government agency or department. The SEC alleged that approximately 600 Health Net employees signed severance agreements with the above provisions in the, between August 2011 and June 2013. [N]othing in this Release precludes Employee from participating in any investigation or proceeding before any federal or state agency or governmental body . . .however, while Employee may file a charge, provide information, or participate in any investigation or proceeding, by signing this Release, Employee, to the maximum extent permitted by law . . . waives any right to any individual monetary recovery . . . in any proceeding brought based on any communication by Employee to any federal, state or local government agency or department. In addition to agreeing to pay a hefty fine, Health Net has agreed to similar terms to those agreed to by BlueLinx, including contacting former employees that signed the severance agreements. The SEC’s settlements with BlueLinx and Health Net come more than one year after the SEC penalized KBR, Inc. for an anti-whistleblower provision in the confidentiality agreements that KBR required its employees to sign when participating in the company’s internal investigations. KBR paid a $130,000 fine for the provision and, like BlueLinx and Health Net, agreed to amend its confidentiality agreement to make clear that employees will not be subject to retaliation for reporting potential violations to the SEC, and they do not need to seek approval before doing so. If you or someone you know has been asked to enter into a severance like the ones described above, please contact our whistleblower attorney team today for a consultation. You can contact our whistleblower attorney team via email at kporter@chrisjen.com, by phone at (801) 323-5000, or by filling out our online form.